It's a plan of my Eddy kite glider. 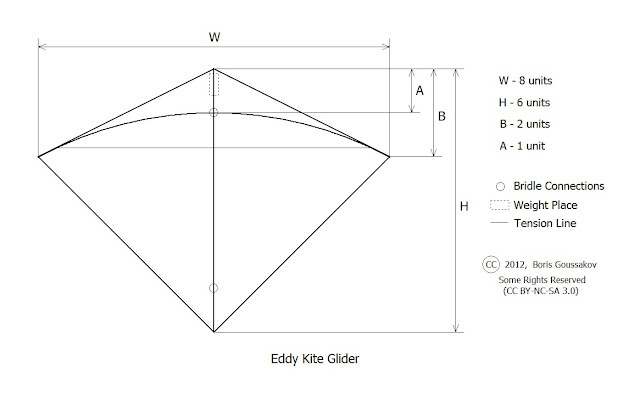 As you can see it is a hybrid of the Eddy kite and fighter kites. It has a wide tail like as fighter kites have and it has a short nose that is closer to Eddy proportions. The spreader is bowed in two directions - from nose to tail and upwards over the sail. After assembling it requires a tuning. A proper weight should be set on the nose for a smooth gliding. looks pretty good! what do you recommend for a sail and framing? I see that the measurements are in general units which is good so it can be scaled up easily but what sizes do you have now for it that you like? The kite shown on the photo above is made of Tyvek. I prefer the paper-style Tyvek 1025D instead of the fabric-style 1443R. PET film (12-25 micrometer) is good material also. If you want to use fabric it must have a high diagonal tensile resistance. I recommend fiberglass for a spreader. Fiberglass is heavier than carbon but the glider must have a weight on the nose anyway. The best material for a spine is carbon. I've made many prototypes of different sizes suitable for different materials. The size of kite shown on the photo above is based on the 1 meter spreader length. One unit is 120mm, W = 960mm, H=720mm. I may just have to try making one. I have a Liama, but it's too big to fly in my small backyard. Is the distance from the tail end of the spine to the lower bridle connector one unit of measurement (as with the nose-to-upper bridle)? Thanks, Boris. I made a few glider-kites myself after seeing (and barely believing!) the YouTube videos of the "Zen" glider-kite. No real successes in my bunch. Then I bought an iFlite (and another!) which "scratched my itch" But I may build one of these, some day. . . Yes, it is one unit distance. Great job... looks fun to fly. If I can source some fabric for this I will give it a go. Do You know where I can get Tyvek 1025D online? Also, does your tension line stay tight or do you release it to pack it away? Just wondering about the portability of the kite. Sorry for a delayed answer. I use tauline knots to adjust a tension line. Tyvek i've bought at an offline store at a nearest Dupont dealer. WA - if you use an adjustable tension line for easy packing, try this trick! Mark the usual flying spot on the line with a Sharpie! Then when you go to set it up next time, move to your mark! I've done this with another glider I use - works easily!! I have a few questions on your glider. 1. do you have the bridle lengths units? At least a good place to start from. 2. How much bow do you put in in units general starting point. I am just getting into kites of all sorts. This looks like one I can try may hand at in making.